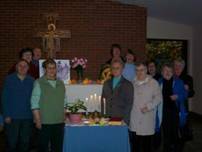 Celebrations were held in various councils to celebrate the Feast Day. Here are some pictures and write up. 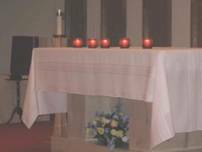 On April 26th we had a prayer service, including a reading from first Corinthians, a Reflection read by one of our members with instrumental music playing and a few minutes of quiet reflection following before continuing with our service. 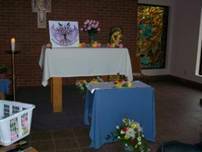 We also included our intercessions/prayers of the faithful. This was followed by a tea and some food. 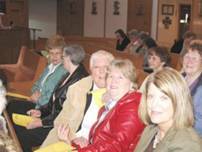 We invited our sister councils from Holy Trinity and Mary Queen of Peace and we had a pretty good turnout. We were pleased and everyone said they really enjoyed it. 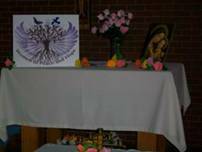 Our Council held an evening of Reflection on "Women of Peace and Hope". Most of our members attended. 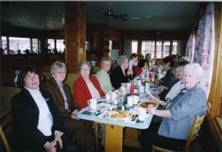 A social was held afterward. It was a beautiful evening. 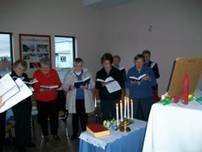 Also on April 26th at the 11:00 a.m. mass, the deceased members of our council were remembered and some of our members participated as Readers and Eucharistic ministers. Through a prayerful reflection of short scripture readings (Colossians 1: 5-6, Ephesians 1: 18-20, 1Peter1: 3-5, Hebrew 6: 18-19, Colossians 1:27), member Regina Warren guided us in examining the true meaning of HOPE. She referenced and discussed Ralph Ranieri's "The Christian Art of Reaching Out" - so important in helping us as Catholic women as we reach out to the poor, marginalized, hurting, depressed...people of our world. 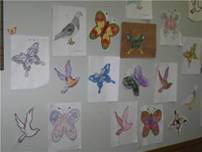 We discussed different kinds and dimensions of HOPE -all aimed at developing and strengthening TRUE hope in our lives. This is the hope that resonates from the Spirit and in turn, leads us to become the light and hope of the world, ready to proclaim that our source of hope is the mystery of Christ living in us. O Lord our God, You are the source of peace. 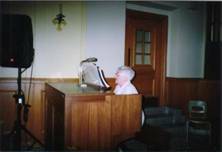 Inspire the women of the Catholic Women's League to live in peace by acting justly, loving tenderly and walking humbly with our God. We pray that You enlighten the eyes of our mind so that we may see what hope Your call holds for us. May we be firm in the hope we profess and always be ready to give the reason for the hope we have. Our Lady of Good Counsel guide our efforts for peace and hope and pray for us. 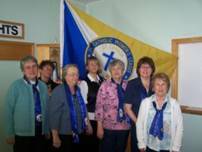 May 28th is the 35th Anniversary of the Catholic Women's League, Corner Brook Council. In conjunction with the anniversary, following the reflection (Peace and Hope) members and guests Msgr.Gale , Fr. Molloy and Fr. 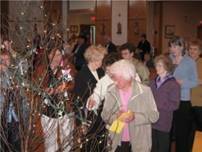 Hynes enjoyed a Turkey Dinner Social. 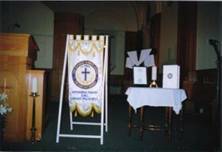 On Thursday the 28th we will all gather at Holy Redeemer Parish to commemorate the anniversary and celebrate the Eucharist. 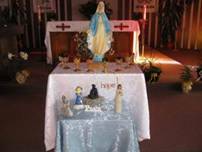 “Our Lady of Good Counsel” mass was celebrated on April 24 at 10:00 a.m. 24 members attended. This was followed by brunch at Gibson’s. 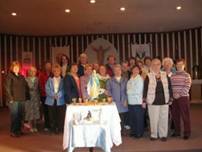 April 26 was celebrated as a “20th anniversary” celebration, along with a day of “Peace and Hope”. 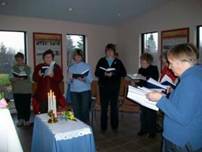 Mass at 11:00 a.m. was a “CWL” mass with members participating as readers, communion ministers, collectors, etc. 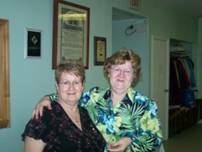 At 5:00 p.m. there was a gathering of members and their friends at the Knights of Columbus Hall. 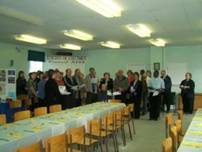 Following a prayer service, there was a pot-luck dinner and presentation of certificates of appreciate to the 7 charter members still active with the council. There was also 2 – 10 year service pins presented. We took the opportunity to have our members engaged in a C.W.L. Mass, where Readers, Eucharistic Ministers, some choir members, the Offertory Procession, are C.W.L. 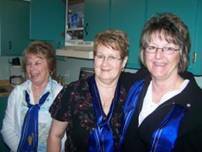 members, all wearing their sashes. 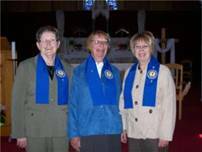 President Theresa Cole spoke on the many good works by the C.W.L. for God and Canada. Two members were presented with their 10yr. pins, a first for this council. 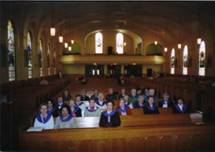 A beautiful church service was held on April 24. 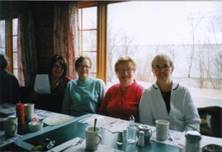 Our Council had a lunch at one of the Dining Rooms here in Labrador City. 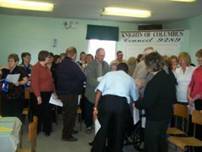 We invited our Pastoral Team and people who have helped the Council over the year. Each member received a Prayer card with the Quote from Romans and a small yellow ribbon rose was attached. 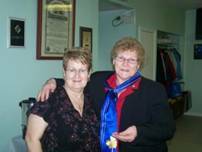 The rose was a reminder of one of our Charter members who passed away a couple of years ago, Ms Dorice Marcil. She made the ribbon roses for us on many occasions. Of course, the yellow represented our hope for peace in the world. 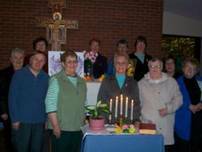 On the evening of April 26, women from nine neighboring churches in CBS gathered with our CWL members at St. Thomas of Villanova Church for an evening of prayer and fellowship, celebrating our theme “Women of Peace and Hope”. The evening started with a beautiful prayer service, led by Colleen Galloway-Butler that reflected on our theme and provided a tribute to women all over the world. 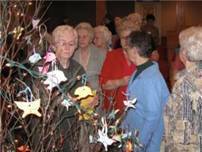 A lighted tree was placed in the church where decorations of doves and butterflies were placed on the branches by each woman present. Each decoration had the name of a woman written on it that had influenced her life. 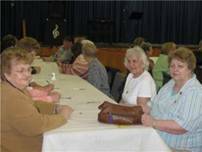 Following the service, our President, Dorothy Locke, offered a warm welcome to the women who had gathered in the church and invited them to move into the parish hall for entertainment and fellowship. Included in the festivities for the evening was a jellybean contest, a getting to know you - 20 question activity sheet (which evoked a lot of laughter), and a distribution of prizes (various criteria). 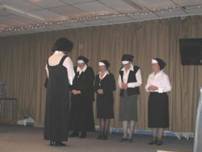 A favor related to the theme was placed on each setting at the table. 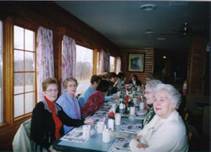 Our guests were then invited to partake of a delightful lunch. Along with a cup of tea/coffee, this made for great conversation and fellowship. No evening of fellowship would be complete without a bit of entertainment. 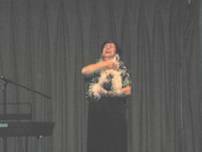 To start things going, Dorothy showcased her talent as she dressed up and lip synced to a Patsy Cline’s old favorite “She’s Got You” – with great drama and action evoking gales of laughter from the audience. Next came Whoopie Goldberg in “Sister Act”, directing the song, I will Follow Him, with CWL members acting as the cast from the movie. 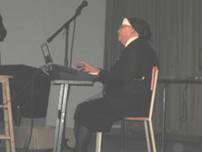 Florence Bussey was hilarious on the keyboard and the “Sisters” trying to contain themselves on stage while keeping sync with the music. The audience laughed and laughed – as did those on stage! The entertainment concluded with solo singing by Nicole Locke, accompanied by Andrea Lundrigan on the keyboard. 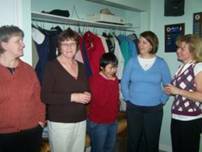 In her closing remarks, Dorothy thanked invited guests, Marie Raymond and Pat O’Dwyer from Provincial Executive for attending the function. As well, she expressed gratitude to CWL members who helped organize this event. Lastly, she thanked all who responded to our invitation and attended the evening of prayer and fellowship. Our council felt this was a most worthwhile event, and we thank Dorothy for her enthusiasm, dedication and hard work. We had a great time, as did all who attended the evening’s function. 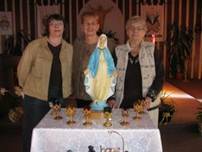 We celebrated May 11, at Mary Queen of the World. Most of the members got a chance to participate. Though only a few of us attended it was a lovely peaceful evening. We continued the celebration with a cup of tea in the church foyer. And then out into the chill evening to home. The reflection used can be downloaded here. Feel free to use it in your council. Will be celebrating during the month of May, check back later for information! !